Multi-sampled glockenspiel, a much expanded version of the glockenspiel found in my sound library Aureus Ventus for HALion 5. More pitches were sampled for this release, making it a total of 19 pitches sampled between G4 – C7 (all “white“ keys +C#5), sampled at 3 velocity layers, the lower 2 played with hard plastic mallets, the highest velocity played with metallic mallets for some extra PING. Also more electronic samples and some wavetables were produced, all derived from glockenspiel sounds and phrases in order to create beautiful, ethereal and haunting glockenspiel soundscapes, drones, textures, plucks, an animated wavetable pad and a multi-sampled spectral pad. Up to 20+ Macros and switches plus the modulation wheel are assigned in each patch, many patches also use aftertouch, providing detailed control over volume envelopes, filtering, amplitude- and pitch modulations, dynamics, stereo animation and more. All patches use some sort of background image in the UI, split patches have colored key-zones in the Falcon keyboard for easier navigation. 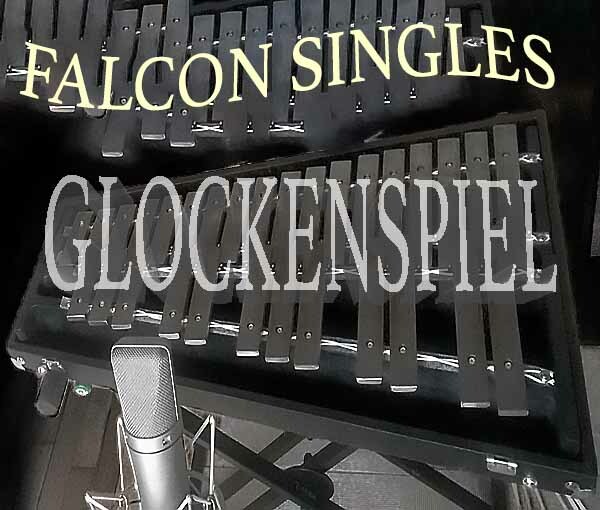 The demos below were produced using only patches from Falcon Singles – Glockenspiel, no post-processing was applied apart from a limiter on the master output.